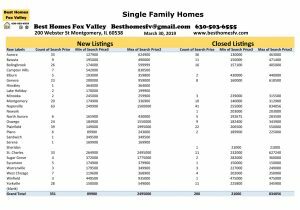 Market update Fox Valley-March 30 2019. New listings of homes this week were consistent with last week. 351 this week compared to 359 the week before. March was very consistent throughout the month. You should be able to click on the picture above to make it bigger. If you would like me to email it to you let us know. There is 1 more day this month but it is a Sunday so we will add it in to next weeks totals. You can see it was a steady increase from January- March. Closed listings of homes increased this week. Most Buyers like to close at the end of the month so that was expected. Look at the increase of closings in March! More than doubled from January and almost doubled from February. We are on the road to a good Spring market! Now is the time to sell if you want to make a move this year. March was more than double January totals. We will see if April is double February totals. Short sales accepted were also consistent with last week. 3 this week compared to 4 the week before. 1 each in Aurora, Bolingbrook & Plainfield. Sellers accepted contracts that are contingent on the closing of the Buyers current home. 3 with a kick-out Clause of 72 hours, 9 with 48 hours and 4 with 24 hours. Contracts were also accepted by Sellers that are contingent on the Buyer selling and closing on their current home. 4 with a kick-out clause of 72 hours, 6 with 48 hours and 2 with 24 hours. Give a call at 630-503-6555 Jeffery Szymczak-Broker ext 104, Bobby Burson-Broker ext 105 or Kristine Heiman-Managing Broker ext 101. Our goal is to negotiate price and terms that are best whether you are buying or selling a home. We can update the value on your home in the current market. Provide you with a net proceeds that shows you the expenses to sell. We will update this when an offer comes in and we know all the terms. If you are thinking about buying a home you need to get pre-qualified with a loan officer first. They will give you a letter that will go with an offer when we find you a home. It states what you qualify for and what type of loan you will be going for. 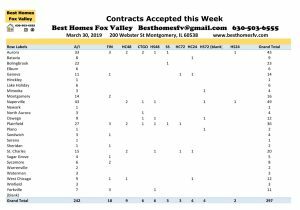 Market update Fox Valley-March 30 2019. Have a great week! Another Search tool – You can see a bird eye view to see where a home is within the block and what is for sale around it. Let us know which one you like better.